There are reports of a big WrestleMania match involving The Miz, but the latest episode of 'Total Divas' showed us that there's a big possibility that the current Intercontinental Champion might have the miss appearing on 'The Grandest Stage of Them All' to be there for the birth of his child. According to The Wrestling Observer Newsletter, the current 'Mania plans for The Miz are to defend his Intercontinental Title against Braun Strowman, although, subject to change. In the meantime there are reports that The Miz and his lackeys, The Miztourage will be feuding with Balor Club, this could be another direction they go with for WrestleMania. However, that all depends on whether or not The Miz will actually be at New Orleans for the show. But if he isn't hell have possibly one of the best reasons for missing work that a man can have. On the recent episode of 'Total Divas' The Miz and Maryse found out the due date of their baby, being April 6th. This is just two days before WrestleMania which means if the baby is late, there's a chance The Miz might have to choose between being at the event, or being there for the birth of his baby. 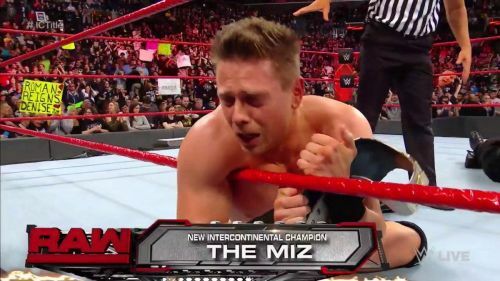 Considering that when Maryse and The Miz announced the baby to the WWE Universe in the middle of the ring, The Miz pledged to be there for the baby from day one, it seems that should he have to make a decision, he will miss 'Mania. The Miz is enjoying one of the best runs of his career at the moment as the head of the 'A-Lister' at the head of the Miztourage. Because of this he absolutely should be part of WrestleMania, but obviously, family has to come first. Hopefully The Miz won't have to make the decision, but either way we here at Sportskeeda would like to wish him all the best.